We only get one chance to make a first impression. And research suggests that you have only one 20th of a second to make a good first impression on your website! A study conducted a few years back by Gitte Lindgaard at Carleton University, found that the research participants formed impressions of websites after viewing a page for a mere 500 milliseconds – literally in the blink of an eye. In addition, the researchers found that our quickly formed first impressions really do impact our long-term opinion of the site and its content. Apparently, due to what is termed “the "halo effect", the emotional first impression influences a web visitor’s judgments about other characteristics of the site, such as usability and credibility. "Organizations that want to persuade people in their 20s and early 30s to give and volunteer don’t have much of a chance if they’re not updating their Web sites frequently and including compelling details about their causes and the people they serve”. But let’s face it, while you certainly want to gain the support of the Millennial generation, keeping your website updated is crucial for all of your visitors, donors and members – regardless of their age! Given that Millennials’ primary interest when visiting a website is to get information about an organization and its current projects, websites essentially becomes portals to action. 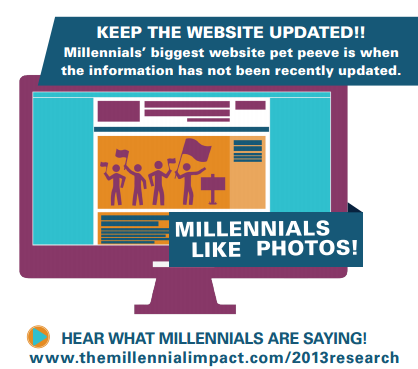 Construct your website to offer the core information upfront; feature immediate opportunities to get involved (whether on social media or in person); and provide plenty of shareable, actionable content—images of the people you’re helping, educational infographics, videos, timely advocacy alerts, etc.—that will inspire Millennials to engage their peers via social media in addressing the issue. 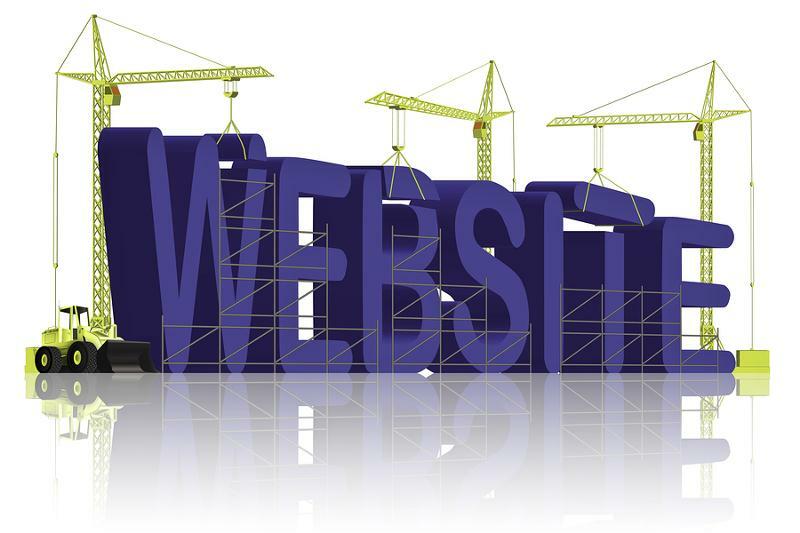 It is very important the information on your website looks professional and is up-to-date, otherwise you will quickly lose the trust of Millennials visiting the website. MAKE IT EASY TO DONATE! 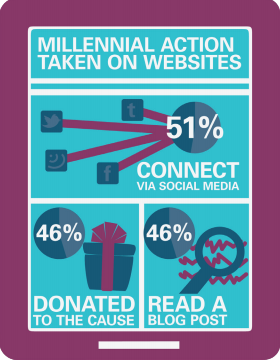 If a Millennial has to click through too many pages before figuring out how to donate to your organization, they will quickly lose interest. Leah: Thanks for sharing your presentation.